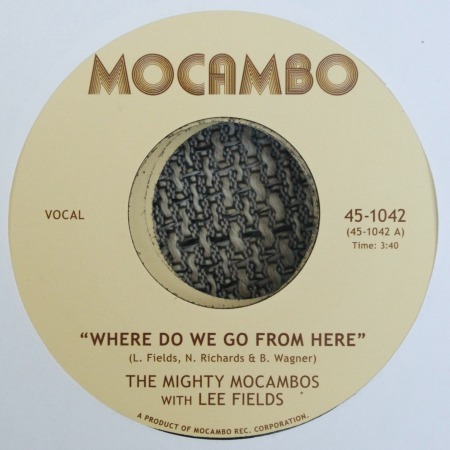 They recently released third full-length “Showdown”, their most accomplished record to date, have been touring Europe to bring its authentic sound to stages far and wide, and now Hamburg’s funk heroes The Mighty Mocambos release a new 45 with an exclusive non-album cut featuring soul legend Lee Fields. Hot on the heels of their current full-length “Showdown”, new double-sider “Where Do We Go From Here” / “B-Boy Suite In B-Flat Minor” shows yet another side of the band’s musical versatility. For the heart rendering A-side “Where Do We Go From Here”, none other than Truth & Soul‘s champion soul man Lee Fields takes over the vocal spot, confirming he is one of the coolest cats around. As a bonus track The Mighty Mocambos are back on the dancefloor with a breakdance DJ-edit of album favorites “Locked And Loaded” and “The Showdown”, aptly named “B-Boy Suite In B-Flat Minor”. 2015 has been a busy and rewarding year for The Mighty Mocambos. This new 45 is like the icing on the cake!